Kimberley - South Africa won the toss and decided to bowl in the second one-day international against New Zealand at the de Beers Diamond Oval in Kimberley on Tuesday. New Zealand, who won the opening encounter of the three-match series by one wicket in Paarl on Saturday, made one change. Debutant Colin Munro replaced fellow batsman Rob Nicol. South Africa were captained for the first time by Faf du Plessis after AB de Villiers was suspended for two matches because of a slow over rate in Paarl. The hosts lost further experience in their batting order when Hashim Amla was ruled out because of a strained right quad muscle. Farhaan Behardien, making his one-day international debut, and David Miller replaced De Villiers and Amla. 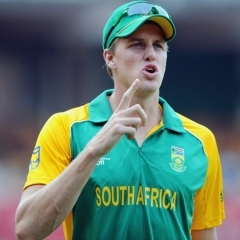 In a rotation of fast bowlers, Morne Morkel replaced Dale Steyn. The day-night match was due to start in hot, sunny weather.